DroidEFB, the leading aviation navigation and in flight support app for Android devices, will be exhibiting at the SUN ‘n FUN International Fly-In and Expo convention. SUN ‘n FUN, Florida’s largest aviation air show will be held on April 5 -10 at Lakeland-Linder Regional Airport. DroidEFB provides pilots with real-time situational awareness via a GPS moving map and this year will be exhibiting at the show in partnership with Open Flight Solutions, makers of the FlightBox ADS-B receiver kit based on the popular Stratux open source software project. Based on strong demand from users, DroidEFB recently released Version 2.1.1 that adds official support for Stratux ADS-B software. At SUN ‘n FUN, the DroidEFB team will demonstrate its new ADS-B capability via integration with FlightBox, an ADS-B receiver that runs the free, open source Stratux software. The DroidEFB team will be at booths N-058, N-059, N-064, N-065. Stop by for a chance to win an Android tablet complete with a FlightBox ADS-B Receiver running Stratux ADS-B Software. 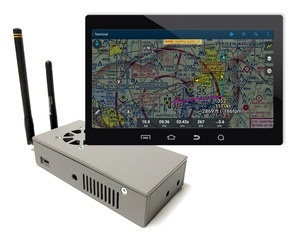 Visitors to the booth will be able to have hands-on access to demo the Android tablets running DroidEFB and experience in real-time how the app functions with the Stratux/FlightBox ADS-B unit. “We are happy to be able to provide integration with the Stratux/FlightBox receiver and partner with them at one of the largest aviation shows in the nation,” said Director of Engineering, Jacek Duda. “Our team worked hard to ensure that the newest version was ready for SUN ‘n FUN. We are very excited to demonstrate our new ADS-B compatibility with the Stratux/FlightBox ADS-B Unit. It’s a significant enhancement to go along with our other great app features: real-time weather, traffic, TFRs, and other flight data for Android devices,” continued Jacek. DroidEFB, LLC is owned and managed by the pilots and software engineers who filled a void for a high-quality, full-featured aviation navigation app for Android mobile devices. Formally known as Avilution’s AviationMaps, DroidEFB provides real-time GPS integrated with aviation charts to display current location. The app provides NEXRAD weather, winds aloft, AIRMETs and SIGMETs as well as terminal procedures/plates, airport and taxi diagrams, chart supplements, flight planning, weight & balance and a slew of other features. For more information about DroidEFB, please visit their website at: www.droidefb.com. Open Flight Solutions is the maker of FlightBox, an ADS-B receiver quick-build kit based on the popular Stratux project. FlightBox provides in-flight weather, traffic, and WAAS GPS for a fraction of the cost of other ADS-B systems. The kits are designed to assemble in five to ten minutes using only common household tools. No computer or electronics skills are required.